The NHL in spite of being the least regarded of the ‘Big 4′ professional sports leagues in the USA still has plenty of interest, but is undoubtedly flipped into the most keenly followed of America’s selection north of the border in Canada, where the hands holding the league’s broadcast rights have just changed for a huge amount of money. The rights to air the world’s leading ice hockey league in Canada (which is home to 7 of the 30 franchises) has gone to Rogers Communications beginning in the 2014-15 season. 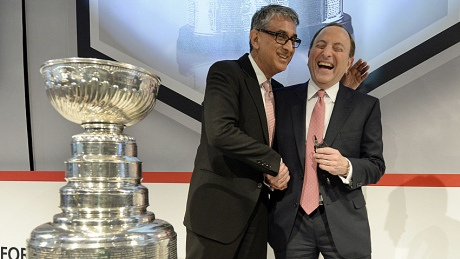 In spite of committing to a mammoth ’12 years’ (taking them at least through to the 2025-26 season), the most surprising element of the deal is its financial terms, as Rogers paid CA$5.232 billion for exclusive TV rights, with TSN the network losing out. This averages around CA$433m per season, and a rise from the current figure of CA$160m paid from Canada, although the exclusive rights deal will not see CBC lose their famed Hockey Night in Canada brand due to an agreement with Rogers (who have made similar deals with TVA Sports as well as French-language content providers) to continue via content licencing. In comparison with Rogers, the current deal for American broadcast was a 10-year spell signed with NBC in 2012 for a collective $2b (CA$2.1b, $200m/season). Prior to a league lockout that occurred last season, the NHL is cited as being a ‘$3.3 billion per year business’ in terms of revenue, though ‘chief operating officer’ John Collins has expressed his goal for the organisation to grow to over $4 billion in the near future, with the newest TV deal likely to be a key factor in getting them there. The Rogers deal sees them take on $633m per season to be ‘significantly’ shared between the 30 franchises.